Completely fresh to the market and consigned by the descendants of the original owner, this extremely rare pink gold reference 6062 "stelline” is a good example of what many Rolex collectors and scholars consider the most prestigious model ever made. Originally purchased in Nyon and kept within the same family for years, the wristwatch is offered with a very well preserved case of attractive proportions and offered with the trade card of the retailer where the watch was originally sold, a Rivoli Rolex service certificate, setting pin and fitted presentation box. In the second half of the 1940s, following the launch of the definitive "Oyster" case shape, Rolex introduced a variety of different watches with a diversity of movements for this case. It was predominantly used for the perpetual model with date window, later named DateJust, until the 1950s when a second aperture was added introducing the weekday at 12 o'clock, the celebrated Day-Date. The "Oyster" case was also produced with different chronograph movements, either with a constant seconds register or three subsidiary dials including the hour register. The most complicated chronograph version cased in the "Oyster" style is the famous "Dato-Compax", later nick-named "Killy" by collectors, featuring a full calendar on top of the chronograph mechanism. The top-of-the-line version however was reference 6062, fitted with the in-house automatic movement, upgraded with a full calendar and moon phase indication. 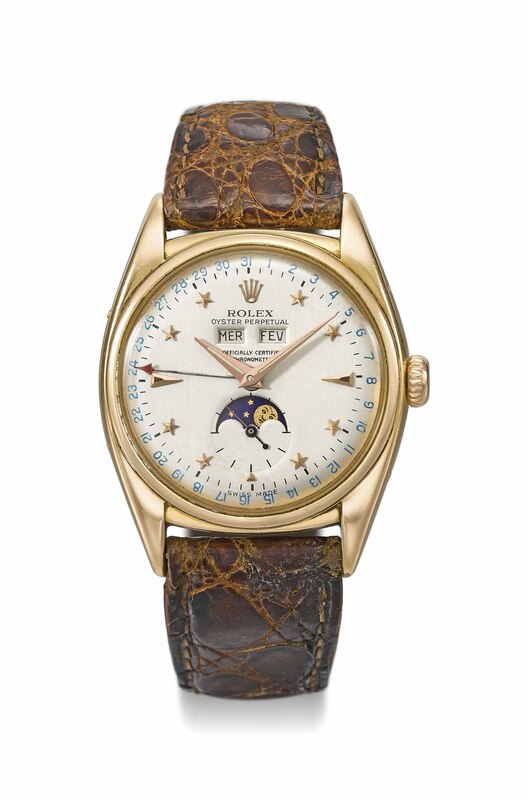 In production only during a few years in the first half of the 1950s, this model is considered the most important Oyster model ever made by Rolex. Reference 6062 was available in yellow gold, pink gold and stainless steel. Many of the watches offered for sale in this catalogue are pictured with straps made of endangered or protected animal materials such as alligator or crocodile. These endangered species straps are shown for display purposes only and are not for sale. Christie’s will remove and retain the strap prior to shipment from the sale site. At some sale sites, Christie’s may, at its discretion, make the displayed endangered species strap available to the buyer of the lot free of charge if collected in person from the sale site within 1 year of the date of the sale. Please check with the department for details on a particular lot. Pink Gold Ref. 6062 "Stelline"